I raise my beer to the unsung Operator heroes! 16L2 wreaking havoc once more. Maybe clean it out for good? There have since been a raft of subsequent faults, all different in nature. The latest is a pair of cryo failures. Aha, so that causes unexpected dumps! Looks a lot more plausible than birds dropping sandwiches in ventilation ducts https://cds.cern.ch/journal/CERNBulleti ... es/1221806 or a hump https://vixra.wordpress.com/2010/07/16/ ... erference/. Can anyone explain why Atlas isn’t getting the same lumi as CMS and shed some light into what happened with the magnet? ATLAS requested the lower lumi. I'm guessing there's little point stressing the computing resources collecting high-pileup data with the magnet off. I'll try to find out what the problem with the magnet is, although I'm sure mfb will tell us soon enough. From what I've heard, it was shut down on purpose to do a special run for the liquid argon calorimeter. I'm not sure I believe that. Last edited by dukwon on Fri Jun 08, 2018 8:02 am, edited 1 time in total. 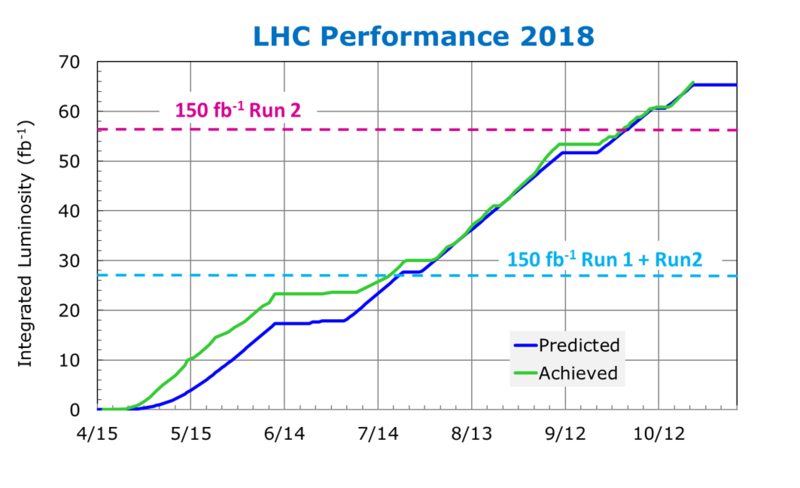 Looks like the current run (#6675) will smash all previous LHC records for sustainable integrated lumi per 24 hour period - at least 1/fb. Notionally this consists of 2 switchovers (time of dump to time of next stable beams) and 2 runs. The switchovers can be 2 hours each and the runs can be 10 hours each. Each run can deliver 0.5/fb. This performance has not been repeated since - yet. Fingers crossed. New switchover record! Run #6773->6774 took 1h23m !! (dump->SB). 21:39 to 23:55 is 2 hours, 16 minutes. I believe the theoretical minimum turnaround time is about 1h45m.